As we turn the calendar page to 2011, we at Brights Central would like to express appreciation to all in the constituency who have donated time or resources to the Brights’ endeavor in 2010. At the bottom of this bulletin, we thank some of the activist folks doing things that we are aware of. But for now, right here, we’ll just thank…YOU! Yes, we are grateful for your support and applaud your continuous involvement. First, by registering as a Bright (upper case), you grew the Internet constituency by one notch. Then, and more importantly, by staying in touch over time, you learn what's happening in the network and are able to participate as you may wish in ongoing or future activities. Pretty much everything that gets done for The Brights' Network (outside of us at BC) is accomplished by volunteer actions. So, if you happen to know who is doing something for the Brights that you appreciate, now is a good time to say so and offer some encouraging words to spur them onward in the New Year. Going Out with the Old? - Then Bring in the New! The website is the locus of information for all interested persons. It is also the hub of communication and/or action for involved constituents. However, it is through the Bulletins and BrightenOps sent out from Brights Central that registrants can best contribute (to the extent they may wish). Consequently, here’s a reminder to all Brights who desire to take part at any future point in furthering the civic aims that are listed on the home page of the website: You need to keep your email address current and have your subscription setting active (as "subscriber"). The turn to a new January generally finds people looking both forward and back. Perhaps it’s that “January” name (the month named for the Roman god of gates and doorways)? Whatever the stimulus, the New Year is a perfect period for many Brights to open the gate and try on a fresh perspective! One need not abandon the old to make use of the new. As we can learn to speak more than a single language, avenues are open for alternative means of self-identity as occasions may require. It’s important that cultural stigma not keep individuals “civically silent” about who they are. The many challenging matters of social and political consequence require abundant representation by citizens who have (and are able to make clear in beneficial ways) that they have a supernatural-free understanding of the world. End of a Year - Looking Back! There is a great need for more people who have a supernatural-free way of viewing the world to be involved in civil society. So, what did you do along those lines in 2010? * Perhaps you took new steps toward openness and affirmative visibility as someone who has a naturalistic worldview? * Maybe you spoke out in casual conversations within your sphere of influence, or formally (in letters to the editor, on the Web, etc.) - for yourself, not for others - as a person who holds a naturalistic outlook? * Possibly you engaged fellow citizens (supers as well as brights) in some constructive ways likely to positively influence their understanding of the naturalistic stance and shape as well as the civic status of other citizens who hold supernatural-free outlooks? * Maybe you in some way(s) - whether alone or with other Brights – took some step to aid progress of the movement in its priority action arenas? Whatever you did along those lines – fantastic! We need more brights of many stripes out in civil society and making decisions in places where decisions are being made, getting elected and leading the way. Some New Voices for Social Change! This movement depends on the activities of the constituents within it. It is not top-down, but bottom up! Progress is up to you! As far as New Year's resolutions go, here are a few possibilities to consider that help to spread both word of the Brights movement and an accurate understanding of its civic focus. "Have you heard about the Brights movement?" 3) You can refresh your understanding of the movement, refocus, and plan an action program in your community for the coming year that you feel is consistent with the Brights’ Net aims and principles by reading the Movement Principles and watching the Brights Videos. Kick off the New Year [B]right! Brights' merchandise – Lots of possibilities! We have plenty of bookmarks (free, or almost so). And, The Brights’ Shop at CafePress carries T-shirts, caps, bumper stickers, and other items. Choose your phrases: “100% natural ingredients” or “Supers and Brights; One Humanity, One World or “Living on the Bright Side” etc. Many items are available bearing the Brights’ logo that can invite notice, spark curiosity, and help you to spread word of the movement. There will be apparel to wear or a bumper sticker that “says what you want to say". This month’s radio interview has brought in quite a few new registrants from the area. In fact, the number of new Brights exceeds the number of Brights in Portugal before the show. Thank you, Nuno! Inspired by the initiative taken by some individuals who acted to shield the family of Elizabeth Edwards from a demonstration by the Westboro Baptist Church at her funeral, several members of the Forum collaboratively authored and attached their names to a letter of support and appreciation to the organizers of the peaceable counter-demonstrations, called by some a "Line of Love". It should be noted that during the authorship process, there was almost no discussion of the politics or other agenda of the counter-demonstration organizers--in fact this was considered beside the point. The counter-demonstrators have diverse backgrounds, and the letter's signatories are diverse brights supporting an action they believe to be positive without searching out extraneous ideological disagreements. Indeed, signatory Marvin noted that "if Brights can stay focused on core principles then we should expect our constituency to cross the political spectrum as well". Perhaps you have an action idea you'd like to suggest? Register at the Forum and make yourself heard . It’s a good bet that the most dynamic college-level Brights group is in California. The following is the start of a very lengthy and highly optimistic report sent in to BC by the group’s current president. 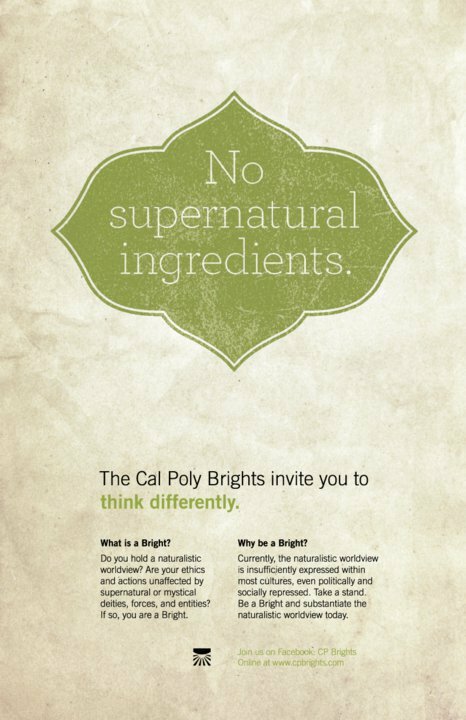 We've been quite busy here in San Luis, and I just wanted to let you know how things are going this year for the Cal Poly Brights. First of all, our branding/awareness campaign is going great! Membership is growing consistently. We're over 200 members and every event we hold yields at least 5 more members on the mailing list. On top of this, our poster campaign (I'll explain in a second) is garnering wonderful attention. I look forward to hearing back from you, and we thank you for all the support. It makes what we do possible. Lots of Ways to Discover the Brights! Based on early feedback from reviewers (and also some Brights who viewed it), authors have executed some revisions to further improve the draft chart, the uniqueness of which has been lauded by almost all who have seen it. Fifty teachers are now scrutinizing the poster, using it during this school year in their teaching so as to report back later on. A plea for support of a pilot (USA-focused) project to enable an initial poster printing has gone out to Brights enrolled in SIG2 (the Categorically Sound Science initiative). Contributions up to $3500 will be matched by a donor to double the effect of SIG members. Interested Brights may contribute if they wish to help boost the initial printing by lowering the per-chart costs. (One poster is $45; 400 is $15 each; postage on top). You can earmark a donation (any amount) to The Brights’ Net via PayPal or send a check to The Brights Net, P O Box 163418, Sacramento California 95916). Say “Evolution Poster Project” to distinguish this donation from a general donation. News at BC -- We Moved! This move was by necessity because the business where we sublet had moved to a new location. We were fortunate to find a spot close by. We like our new digs (sort of), although we miss the view of the trees outside the window. And, we are now paying market rates rather than our “friendly” rates of the past. However, of one thing we are quite certain: We don’t want to move again anytime soon! Having changed the office location right at November’s end turned early December into rather a headache at BC. (There have been “situations” regarding locks, carpeting, payments gone astray; papers lacking a signature… put altogether, rather unbelievable!) There were also a couple of foul-ups in switching from one Internet carrier to another, with the telephone aspect not yet resolved (we’re still trying to regain the prior office number). However, things are starting to look up now, fortunately. If we have missed out on your communications due to the changes, we apologize. Please do re-send anything you deem of importance. Everything is finally coming back together for us. We at BC want to say thanks to all the individuals who are administering and facilitating the international Brights’ Forum. We recognize your dedication to the movement and acknowledge your flair for handling the Forum's many challenges! Because you continue to check in day in and day out from your several different countries across the globe, we are able to offer a forum venue where Brights of many stripes can meet and greet and collaborate, and where others can learn about this movement. Thanks also go out from Brights Central to the public “Enthusiastic Brights,” to all those involved in leading Brights Community Clusters (BCCs) or Brights Meetups or collaborative projects, and to a few special folks named here (Paul, Quentin, Diane, Davis, Joel, Bob, Paula, Brant, and Ruban).